It felt a bit redundant to try and pull references out of the bag when talking about Gareth Pugh’s latest collection. The ultimate point of his work is to push boundaries and in recent seasons, push them in a way where commercial sense straddles comfortably with high-octane design. As the show began with a light installation that flashed on and off in time to Kylie’s Confide in Me string intro, simultaneously, light would be shed on Pugh’s latest turn. It opened with a refinement of previous shapes that he has explored with rubber and leather draped jackets, panelled with a chevron tessellated pattern, paired with again, a further development of the fluid wide-legged pleated trousers or narrow legged trousers that flared out at the sides to form an air-borne fabric trail. This was all the black drama we’ve come to expect but then a vivid shade of azure blue kicked in signaling Pugh’s first use of a significantly different colour (shades in between white and black don’t count) and it was mostly placed into solid swathes of fabric that hat jackets nipped in with matching flowing skirts or as a cape that blew out. Gold metallic squares forming disco ball decoration then lit up the room just as the installation had done at the beginning. Star Wars, superheroes, disco fever, high priestesses and religious iconography – all things that you could pull up but in Pugh’s case, the specific imagery isn’t necessary as the resulting collection just doesn’t necessitate the need to be linked with anything other than Pugh’s name and his alone. Dazed Digital: Several things came to mind when seeing the collection – disco balls, Star Wars, high priestesses? DD: What was different about this collection as a shift from your previous ones? 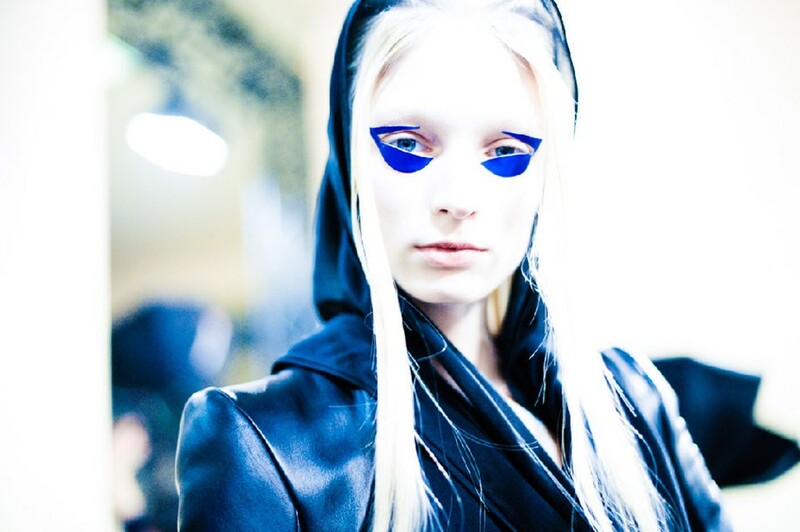 Gareth Pugh: It was the first time I used colour and I used it in my pre-collection presented at Pitti. So this was follow-on from that and this was the end result of that process of that exploration. So this was very much more aggressive and feminine rather than the elegant feel of that pre-collection. DD: Where did that shade of blue come from? Gareth Pugh: It was loosely like an Yves Klein kind of blue, which is very beautiful but we kind of made it more vibrant than that. It’s a very specific blue. With the eye make-up and the gold, it was supposed to be an alien take on the high priestess.